My daughter is becoming quite the artist. She loves to color, draw and paint. I like to encourage her creative side but I am also realistic about the space of our home. There is no way we can devout a whole room to arts and craft. But maybe a small corner we could manage. US Art Supplies does a great job at providing a kit that included a table top easel, a couple canvas panels, some acrylic paints, brushes, plastic palette to mix colors on and a little palette knife. 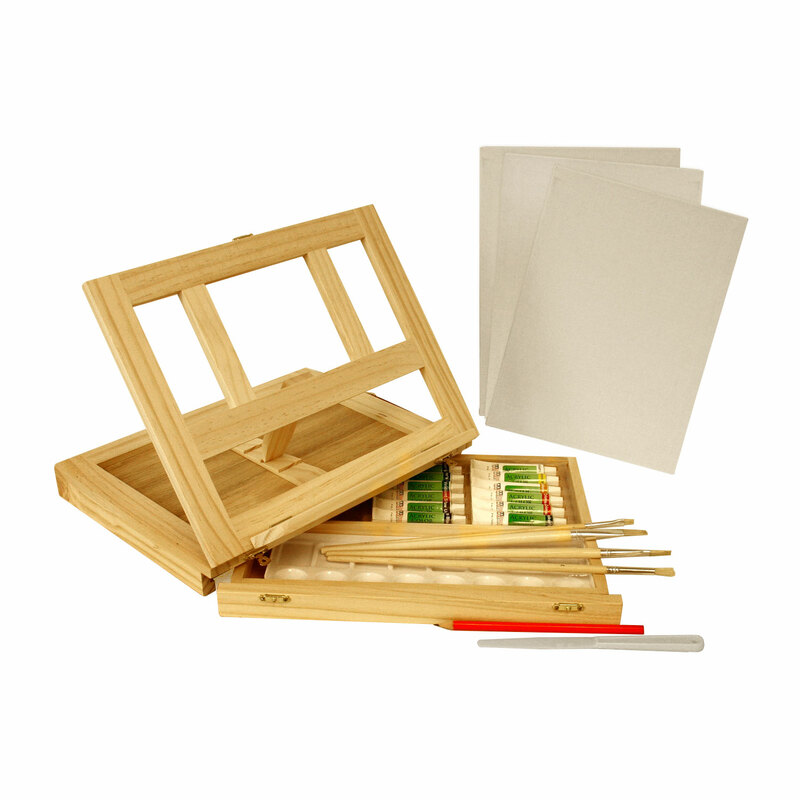 The Wood Table Box Easel Painting Set is a wonderful set for the beginning artist, someone that likes to travel with their art supplies or anyone that is short on space. One of my favorite features of this set is how it can all collapse and store in a cupboard or a book case or anywhere else you have a little free room. It really does not take up much room. I also like how we can take this with us camping, road tripping or anywhere else AND because of the table box easel she can set up and create a master piece just about anywhere. Now she can capture those crazy squirrels climbing the trees outside or the bunnies frolicking through the yard all while sitting a few feet away at the patio table. If you are looking for a set that will get you in touch with your creative side I highly suggest this kit. Or if you are looking for a present for the holiday or birthday this would be a great set for those occasions. I received US Art Supply Easel Box Set with Acrylic Paint Kit complementary for evaluation purposes. Regardless, all opinions expressed are still 100% my own. I am disclosing this in accordance with Federal Trade Commission 16 CFR, Part 255 Guides Concerning the Use of Endorsement and Testimonials in Advertising.